First-time yogurt maker, finally. Of course, it’s been on the to-do list for ages, just never got around to it. I actually tried a few weeks ago, but the milk I used had been sitting around for a bit too long, and actually curdled itself while I was heating it and turned into a ricotta-type product. I salvaged it into lasagna, but it wasn’t the yogurt I was hoping for. So this time around, we used fresh stuff. Making yogurt is really just a few simple steps, though there are countless methods for getting there. 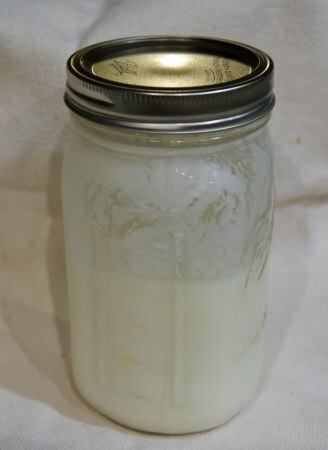 I used a half-gallon of milk, split it between a couple quart jars, and placed them in a pot of water. Put the pot on the stove and heat, until the milk reaches the right temperature. You can also heat the milk directly in the pot and pour into jars later. Or use a crock pot. Take the jars out of the pot of water and set aside to cool – this’ll take a little while. I put mine in the garage to cool faster. Don’t put hot jars in the freezer or cold water, or there’s a fair chance they’ll shatter. At this point I put the pot of (hot) water into a cooler to set up the incubation. When the milk is cooled sufficiently, add some yogurt (a couple heaping tablespoons for each quart) and stir it up. Put the jars into the cooler with the pot of (hot) water. Wrap them in a towel for even more insulation. Close the top and leave it alone (yogurt doesn’t like to be disturbed until it’s ready). You can incubate lots of places too. I’ve seen a gas oven with the pilot light, an electric oven with the light on, an electric blanket… anything to keep it warm enough for the bacteria to take over. After many hours, it should be good to go. It was creamy and tangy and chock full of good things for my digestive tract. It’s also really good for a first food for babies. Except if there are known milk allergies in the family, which I guess there are in your house. My kids and my husband eat a ton of yogurt. We’d go broke buying plain, whole-milk yogurt.